Baked dried apricots, I should clarify. Being too chilly to grow round here and not being a fruit that travels well, it’s nigh on impossible to find a good apricot in Scotland at the height of summer, let alone in the depths of winter. The dried ones are very nice indeed but just recently I’ve discovered a way to make them beautifully moist and gently spiced. Add the apricots to a ovenproof dish big enough for them to lie one or two apricots deep. Scatter a little chopped crystalised ginger over the top. How much? Depends how gingery you want it. I made about 25 apricots and used 2 marble sized chunks of crystalised ginger. That was enough for a slight zing. Pour water over the apricots and ginger until they are just covered. Leave to soak while the oven heats up to 170oC. Cover the baking dish with foil and bake the apricots for an hour or until almost all the water is absorbed and there is just a little sticky liquid at the bottom of the dish. 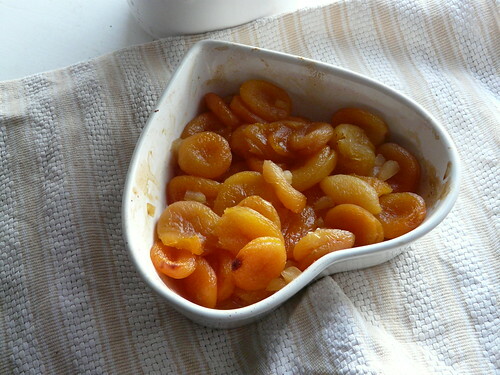 In winter I often cook apricots on the stovetop, poached in some water and honey, maybe with a pinch of dried ginger. However I’ve never thought to bake them in the oven. Lovely idea Wendy. And in a heart-shaped bowl. Apricot ginger upside down cake? I’m already drooling. Yes, I’ve often poached dried apricots on the stove top, but baking sounds a gentler way. I’m also having a preliminary drool over your apricot ginger upside down cake. This sounds lovely. I’m looking forward to the cake! There is this Indian recipe with dried apricots with cream… I can’t remember the name, but this reminded me of it. So easy! And as Kathryn wrote on her link to this post — perfect porridge topper. Oo, that sounds beautiful with ginger! I like your snowing banner too. 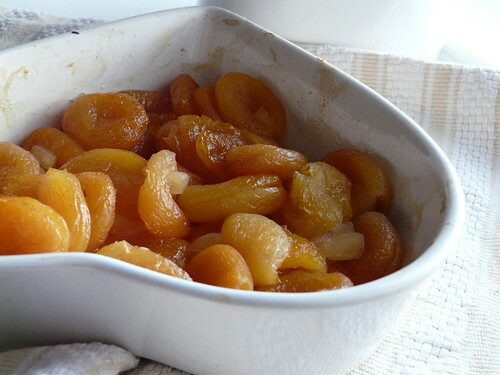 I’ve never had baked apricots, but these sound warm, flavorful and comforting! Kathryn – You were way ahead of me then! The ginger works so well. Sue C – It is very good. It’s coming very soon! Maninas – That sounds delicious. Hope you remember it and post about it. Sara – Let me know what you think! Heather – Had just that the other morning. Lovely. Arwen – Thank you. Makes me feel festive. Shauna – I know. I always find myself nibbling on them half heartedly. They’re pretty amazing like this. Great idea, but what about the sugar? Just add it with the ginger? And how much of it? Mp – Well spotted! Shall amend. The sugar goes in at the same time as the ginger. I used about a tablespoon for this amount. Thanks. I guessed about as much. Apricots are already baked, now on to the cake. I use to live in Scotland a long time ago and I remmeber my mother always had prunes and dried apricots sitting in pots on the kitchen range always great winter treat ona miserable wet day or a very cold Canadian winter Like my mother they are always on my stove could you use the recipe for pineaplle upside down cake?????? Wow – had forgotten about these, haven’t made in ages. Thanks for the reminder!